INDEPENDENT TD AND chair of the Turf Cutters and Contractors Association (TCCA) Michael Fitzmaurice has said the government’s new strategy for the conservation of bogs will not solve the problem. Turf has been a contentious issue over the last decade as the government moves to conserve designated raised bogs, while cutters fight to retain their cutting rights and ownership. Yesterday, Minister Josepha Madigan published a new conservation management plan to cover the next five years. It includes plans to start restoration work on a number bogs across the country and commits to further work relocating turf cutters to non-designated bogs. It has so far only achieved this with 64 turf cutters moving to two sites. Speaking on RTÉ’s Morning Ireland today, advocacy officer with An Táisce, Ian Lumley said conservation and restoration work of this kind should have started 20 years ago. He also said turbary rights – the right to cut turf - are “part of the past”. We have to look at a future, we have to look at not just the ecology of the bogs, but the entire future of turf cutting and extraction for all sorts, whether it be for horticulture or for electricity. However, Fitzmaurice said that while his organisation is in favour of conservation, he believes the government’s outlook on the situation is overly optimistic. “You wouldn’t say that if you’ve got a quarter of a problem solved that you’ve got it solved,” he told Morning Ireland. There are 9,000 plot or turbary owners across Ireland, and while not all of them are actively cutting turf, the ones who are do not want to give up the practice. 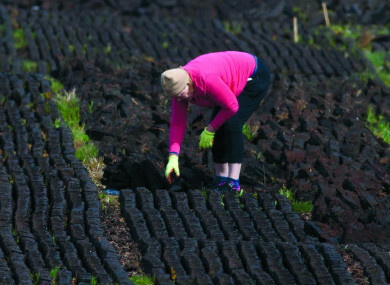 Fitzmaurice said that in order for restoration work to take place on some of the designated bogs, conservation workers would have to put in a ‘buffer zone’ – a drain between the bog and farmland. If the farmers are not consulted about this, he said the government “won’t achieve anything”. “This was never about money for the people that want to continue exercising their right,” he said, adding that this is about making sure people who “had a heritage and tradition continue that”. Email “'This is about heritage and tradition': Turf cutters say the new bogs strategy won't solve the problem ”. Feedback on “'This is about heritage and tradition': Turf cutters say the new bogs strategy won't solve the problem ”.